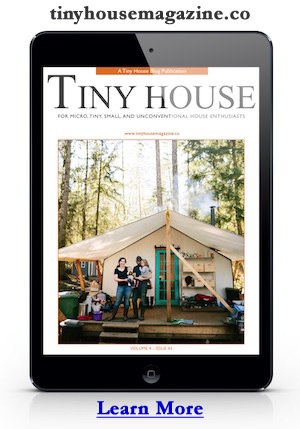 John, one of my readers, shared his tiny house project with me. It’s based on one of my free tiny house plans, the 8×16 Tiny Solar House, but instead of mounting it on a trailer and putting a lot of glass in the tall wall he built it on a foundation and added a 6′ by 16′ porch. In this configuration, it looses its passive solar capacity but it sure makes a nice little cabin in the woods. The cabin is off-the-grid and will have a photovoltaic solar panel array up a nearby hill where more sun makes it through the trees. Thanks again for sharing this with us John! This entry was posted in Tiny House Projects and tagged 8x16, cabin, tiny house, woods. This is just a general comment not meant as criticism to this gallery. Why do we always get so many outside shots and so few inside ones? Totally agree. I would love to see the inside. I love this design, I agree with Jay and Janet, more interior shots, however I understand that not every small homeowner is a keen exhibitionist of their living space! I good compromise would be to include either a floor plan or some interior shots, simply to give everyone an understanding of what was done with a space, and of course to get inspiration. I am very inspired by John’s take on the Solar house. Love the screened in porch to expand the living space. If only there were a way to winterize it?? I am assuming that there are no interior pictures because the inside isn’t finished yet. He’s probably very excited to show off what he has done. I would be. I’m wondering why, if he is going to build on a foundation, did he build an 8 X 16 cabin when he could have built it 12 x 12? 12 x 12 would be 16 sq.ft. bigger for the same exterior wall length. Great porch. Every cabin ought to have one. I would guess because a lot of building supplies come in 8′ and 16′ lengths. Just a guess though. Going 12′ would require more cuts and more potential waste.